It’s crunch time in the NFL world. We’re heading into the Conference title games and most of the league is scrambling to fill vacancies in coaching positions. But we’re going to talk about something far more important. You’ll have to find your Adam Gase memes elsewhere. The news everyone was waiting to hear? Referees! NFL announced the officiating staff for Super Bowl LIII. The crew is led by referee John Parry, who has been officiating NFL games since 2000. If you’re interested in ref stats, the Internet has those too. What’s interesting here is that Parry is getting the nod shortly after what many — especially Dallas Cowboys fans — would consider a botched call. You can be the judge, but it seems odd to call a sack when it’s an offensive lineman with their arms around the QB. In case you’re interested, 71 is Dallas tackle La’el Collins. Just based on that replay, it looks like the Rams defense caught him out of position, but this is actually a nice recovery from Collins. He recognizes there’s nothing but open field behind him and is basically doing everything he can to give Prescott some open space to work. I’m not saying that this call determined the outcome, but in a one-score game, every play is critical. Time to check out the ratings update from the Divisional Round. 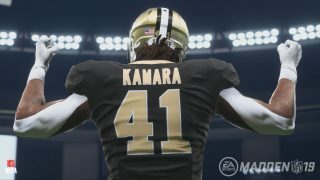 Kamara and the Saints came out of the bye week sluggish, falling behind 14-0 early against the Eagles. In retrospect, that’s not much of a surprise considering New Orleans rested most of their players on Week 17, too. They fought their way back though to win it, and Kamara was productive as usual. Look for him to be fed even more as a passing option against the Rams where the Saints can undercut L.A.’s talented secondary. 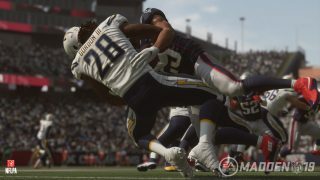 Sony Michel steamrolled the Los Angeles Chargers as the Pats built an early lead that they never gave up. Almost all the damage was done early, as Michel totaled 105 yards and three touchdowns in just the first half. 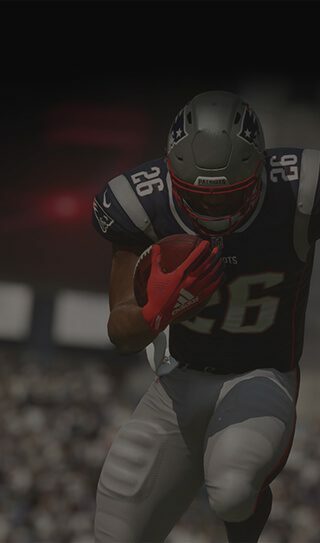 James White is still around but look for the Pats to wear down defenses with Michel and White the rest of the way. The Dallas passing offense was sluggish to start the year but received a jolt of energy after the Amari Cooper trade. That trade helped Gallup get more acclimated to the NFL-level while Cooper took some much-needed pressure off the rookie. It may have been in a losing effort, but Gallup finished his rookie season with his first 100-yard game. Almost nothing was in Melvin Gordon’s favor against the Pats. They fell behind early, wind chill was 23 degrees, and he was running on two beat up knees. It’s hard to blame him for a bad day since most of us can’t get out of bed with two bad knees, let alone play the Patriots. He did manage a touchdown, but just 15 yards on the day. It was a great year for Gordon, and we look forward to seeing him back in action next season. Vander Esch was all over the place against Seattle in the Wild Card round. But against the Rams was a different story. A critical run-stopper, Vander Esch totaled just four tackles as the Rams had two rushers go for over 100 yards. Good news for Dallas, their rookie linebacker showed absurd potential in his first year of NFL action. The football future for Dallas is looking pretty good. Ebron made some mistakes in this one, including a dropped pass and a false start. It might end on a down note, but you could argue Andrew Luck’s successful comeback would not have been possible without Ebron. Consistency remains an issue for him, but Ebron has establish himself as a quality red zone threat.